​Need an island getaway for you and your dog? Look no further than Red Bud Isle. The 17-acre island sits in the middle of Lady Bird Lake near Tom Miller Dam. You can simply drive across a short bridge and park on the island (which is, to be clear, only a few feet from the shore, but it is technically an island). There’s no admission fee, and the park is open from dawn to dusk. Let Your Dog Frolic: There’s a small, designated play area for dogs near the parking lot, and it's a good place to hang out for a while if your pup is a little shy or if you’re not sure how it will react to having an entire island to roam. The main trail loops around the outer edge of the island and is wide enough to be a play area of its own. The trail itself is only about a half-mile long, but expect plenty of meandering along the way if you allow your dog to run free. Dense brush makes up most of the center part of the island, but there are smaller trails that crisscross it. Your furry friend will have three distinct areas to explore: the main trail, the slightly elevated center part, and the water. On hot summer days, the trail can get muddy quickly from all the dogs getting in and out of the water. The water is easily accessible at several points on the island, and dogs always have a blast. Explore the Island: One spur off the main trail leads to the tip of the island, which is covered in gnarled-looking exposed roots. They can be tricky to walk on (for humans and dogs), but they provide a great photo opportunity. Also from this vantage point, you can look up and see the mansions of Austin’s rich and famous lining the cliffs above the lake. Go Kayaking: If you’re dogless or your dog doesn't mind boats, there’s a small ramp for launching kayaks and canoes on Red Bud Isle. Note: As you approach the nearby Tom Miller Dam, the water starts flowing faster and is in unpredictable patterns. If you’re not an experienced kayaker, it’s best to avoid this area. The rest of Lady Bird Lake, however, is either slow-moving or perfectly still water. There's a small parking lot that only holds about 40 cars. The closest alternate parking is about a half-mile to the west on Lake Austin Boulevard. However, walking to Red Bud from there is dangerous because you'd have to navigate a busy, narrow, winding road along the way. If the lot is full, your best bet is to grab a bite to eat at one of the places listed below and try again later. 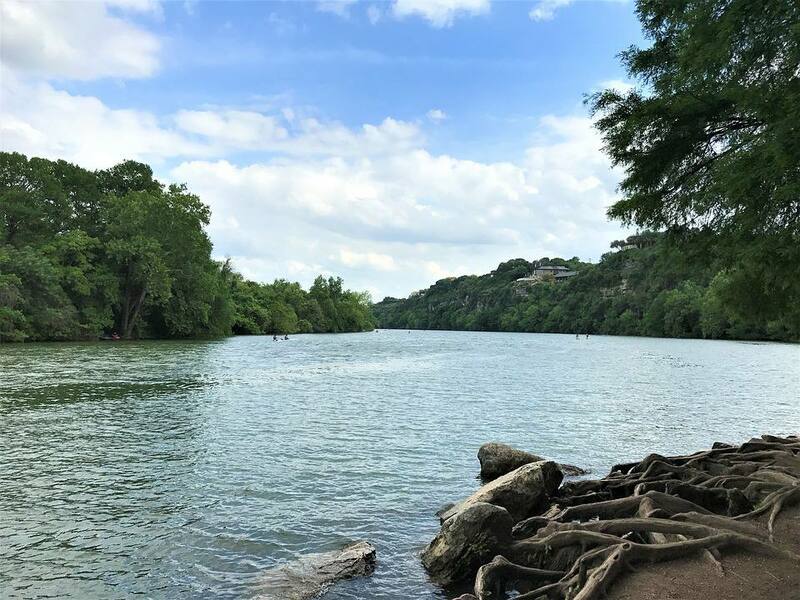 If you're looking for something to do in the area while you wait for a parking spot, or you want to spend more time exploring this part of Austin, here are some ideas of things to do near Red Bud Isle. Check Out the Neighborhoods: The neighborhood just to the east of Red Bud Isle is Tarrytown, and the one just to the west is West Lake Hills. These are two of the most affluent neighborhoods in Austin. You may be tempted to drive through the area and gawk at the multimillion-dollar homes, but make sure you drive with caution. Most of the roads are narrow and winding, and it’s very easy to accidentally end up on someone’s private road. Also, the drivers in the neighborhood are not very patient with those who drive slowly along two-lane roads. Hang by the Lake: If you can’t find parking at Red Bud Isle and just need to find a spot to wait for a while, head to the nearby Walsh Boat Landing. It’s little more than a boat ramp surrounded by a patch of green space, but it has a beautiful view of Lake Austin. There’s enough space for your and your pooch to stretch your legs, and the dog can do its business (remember to scoop the poop). Watching the boats come and go is very relaxing, and you could even enjoy a picnic lunch at the landing. Go Hiking: A couple miles north of Red Bud Isle, Bright Leaf Preserve is truly one of Austin’s natural treasures. Although dogs aren’t allowed, you can participate in regularly scheduled guided hikes at the 200-acre preserve. The property was pieced together over time by philanthropist Georgia Lucas. She wanted a substantial piece of land within the city limits that could showcase Austin’s unique flora, fauna and geology for generations to come. The guides are often experts who share interesting tidbits about the plants, animals and rock formations in the park. Tee Off: Lions Municipal Golf Course is located a stone’s throw away from Red Bud Isle on Lake Austin Boulevard. This city-owned golf facility is an affordable, no-frills course. Enjoy it while you can because discussions are underway to develop the valuable property, but locals are still fighting to keep their beloved golf course. Hit the Water: If you don’t have a kayak of your own, you can rent one at The Rowing Dock, which is southwest of Red Bud Isle near the Mopac highway. You can also rent canoes and stand-up paddleboards at the dock. The Rowing Dock also offers guided trips to see the bats on Lady Bird Lake and fireworks on July 4th. For something completely different, you can even take a yoga class held on stand-up paddleboards. That’ll test your balance! Explore the Nearby Park: A couple miles north of Red Bud Isle, Mayfield Park has nature trails, gardens, beautifully restored historic buildings and peacocks. The peacocks on the grounds are descendants of the birds the original owners received as a gift in 1935. Take Your Dog Elsewhere: A few miles to the northwest, Emma Long Metropolitan Park is another dog-friendly destination. Turkey Creek Trail is leash-free and winds its way through creeks, dense forests and open meadows. A casual burger joint on Lake Austin, Ski Shores Cafe has been a favorite weekend destination for Austin families since 1954. It can get busy on weekends, but even the wait is pleasant while lounging next to the lake sipping a beer. There’s also a play area for the kids. If you want to go directly from swimming in the lake to having a burger and a beer without bothering to change, this is the best choice. Most of the customers wear little more than bathing suits and towels. In addition, Ski Shores often has live bands playing in the evenings. Featuring an Austin-weird combination of food dubbed Polynesian Mexican, Hula Hut is a festive, multi-level eatery with an outdoor dining area over the water. The outdoor area also features a large U-shaped bar that can get rowdy on weekends. A small dock is available for people arriving by watercraft. For starters, don’t miss the mango-poblano chile quesadillas, a perfect combination of sweet and savory. The grilled Hawaiian chicken is another cultural mashup, served with pineapple, Monterrey Jack cheese, and Polynesian plum sauce. A two-story structure with several indoor and outdoor areas, Abel’s on the Lake is right next door to Hula Hut. Serving huge burgers and hearty breakfast plates, such as chicken and waffles, Abel’s is usually less crowded than Hula Hut but also a little more expensive. The restaurant’s oysters on the half shell are consistently fresh and worth the price. The restaurant also has a small boat dock. In addition to serving excellent fresh-roasted coffee, Mozarts Coffee Roasters has decadent desserts, ranging from red velvet cake to cheesecakes and tiramisu. The dog-friendly patio is right on the lake. Plus, there’s free wi-fi for those who want to get almost no work done. During the Christmas season, the shop presents an over-the-top light show every night. Parking can be a challenge due to the close proximity of both Abel’s and Hula Hut. Built out of an old lake lodge, County Line on the Lake is rustic, laid-back, and family-friendly. The pork ribs and brisket routinely earn high praise from diners. Expect generous helpings of everything, but leave room for the peach cobbler. Groups can save a little cash by ordering the meal family-style. Instead of individual plates, dishes are served on large platters to be passed around. Situated on a quiet stretch of the lake, the restaurant even has a little walkway along the water where you can walk off your meal and watch the turtles and ducks.